Our mission is to be strategic Planner for all the activities of this Ministry and to be the ambassador for all the foreign funded projects executed by the Ministry by way of planning, monitoring, coordinating and evaluating the project activities through a service oriented approach while providing efficient IT platform for all the divisions and connected stakeholders. 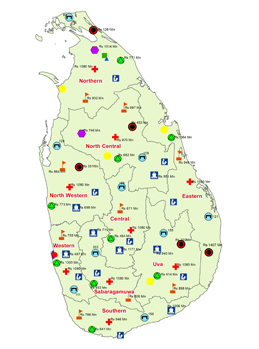 To support Local Authorities in Sri Lanka to deliver services and Local infrastructure in a responsive and accountable manner. To increase mobility and enhance the quality of living standards of the rural communities. To improve the connectivity in the Provinces by improving of Provincial and Rural Roads and Bridges. To provide improved better infrastructure facilities & services to the public specially, drinking water for CKD areas while uplifting the Local Authorities from the present backwardness. To Improve Urban Environment and better public health for Urban and Suburban residents through improved marine and inland water quality and a resulting improvement in hygiene and sanitary condition. To promote the effective and sustainable management of the irrigation infrastructure, and to achieve sustainable improvement of water and land productivity. To enhance access to quality of primary and secondary education to provide a foundation for the knowledge-based economic and social development of the country. To upgrade the standards of performance of the public health system and enable it to better respond to the challenges of malnutrition and non - communicable diseases. Updating strategic plan of the Division. Preparation of Annual Action Plan of the Division. Monitoring the progress of all ongoing foreign funded projects and identify available key issues in order to overcome the challenges. Conducting NSC meetings and progress review meetings. Preparing Cabinet papers & other documents. Maintaining proper coordination with all the Divisions/ Branches/ Institutes in the Ministry. Preparation of Ministry Annual Action Plan/ Strategic Plan and submit to all relevant Ministries. Preparation of progress reports Monthly, Quarterly and Annually in order to submit the relevant Ministries as well as Monitoring the performance of the both functioning Local & Foreign Funded Projects. Conducting progress review meeting with relevant divisions, projects, institutions in the Ministry to measure the performance. Identifying appropriate project proposals for the upcoming years. Analyzing reasons of the projects which showed low performance in previous year. Preparation of Annual Performance Report. Updating Ministry Website per weekly as on attractive way to disseminate the relevant information to stakeholders/ Users. Implementing Data base to gather information. Established and function project publication center. Re - establishing and monitoring existing network of the Ministry. Coordinating and Supervision of the LGN 2.0 Project Work of the ICTA at Ministry premises. Maintaining a Paperless Environment at the Ministry Premises.